Write original text for brochure and follow-up sell sheet from research materials and input from owner and president Laurie Cadigan. Charles crafts strong sales messages that don't feel like selling, because they're born of reasoning, facts, and clarity of style. He's my first call when outsourcing a writing project, and he is more than a pro copywriter; he's a marketing partner. If you have the chance to work with him, take it. This glossy agent brochure demanded specific and precise messaging — and company positioning — to inspire the all-important trust needed to successfully market high-end real estate properties. 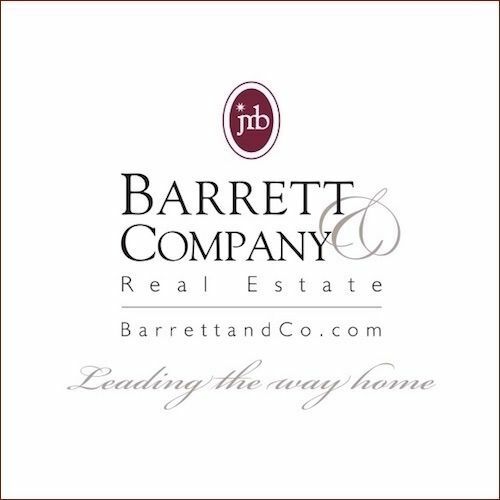 Themes included Barrett's deep expertise in real estate marketing; their extensive knowledge of local properties and the current business climate; and strategies for maximizing the sale. One brochure panel addressed the needs of sellers; another was written to buyers. This Project Detail section focuses on a follow-up project: A simple sell sheet to which we were able to add significant value. 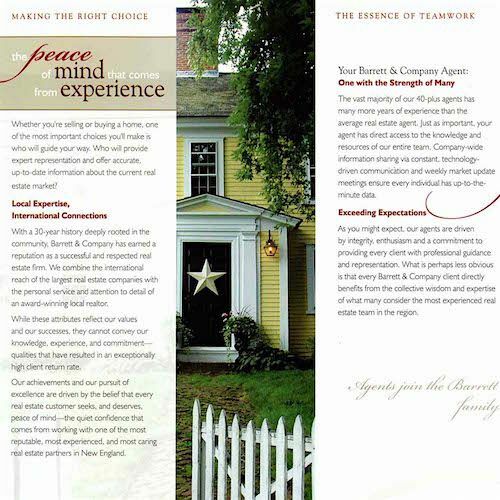 The president of a leading New England real estate group asked us to write a "Why choose us?" sell sheet for listing agents to use in marketing proposals and in leave-behind packages. The Issues This was a marketing piece that needed to make life easier for both parties in the sales encounter: the agent and the customer. 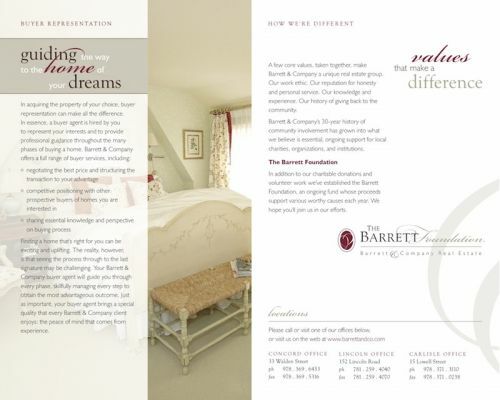 Barrett agents routinely give presentations to luxury home owners whose properties will sell for millions. In this type of high-stakes marketing, success depends on striking the right balance of facts/data, clearly stated benefits, and down-to-earth sincerity. The prospect wants to see an undeniable track record of success, but beyond that s/he wants to know the real estate agent and company are trustworthy. We chose to take the assignment beyond copywriting, and to design the piece for maximum effectiveness. It also made sense to repurpose the work for agents’ in-house training. Problem for Real Estate Agent Multiple, competing sales points, all of which are important to convey to the prospect. Which will resonate? Which are most effective? Problem for Prospect How can I sift through all the information offered and choose the right real estate agent for me? The Challenge Convey the most important selling points (many of which are claims all realtors make) in an engaging, credible and persuasive way. 1. 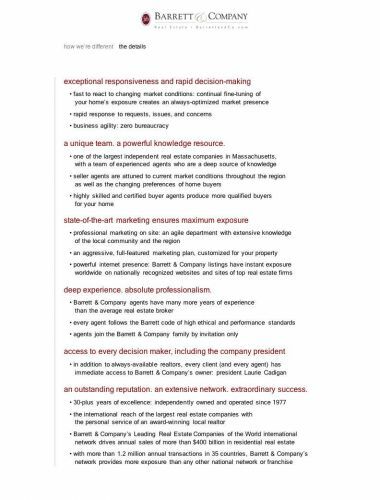 Interview top agents within the organization. Distill multiple opinions, perspectives and sales points down to only the most essential ones. 3a. For both agents and clients, the front side must instantly give the impression of a very quick read — while drawing readers to the supporting information on the reverse side. 3b. Back headlines, identical to those on the front, are followed by clear, meaningful details the reader can process and use immediately. The back closes the sale, and while it contains plenty of information, it too is easy to scan. 4. It must be an effective standalone piece, that is, if taken out of the marketing proposal and considered on its own, it must cover all essential sales points—and do so as concisely and as persuasively as possible. Thus it doubles as a leave-behind. An attractive laminated card that is left out on the table will continue to sell even after the presentation is over and the agent has gone. 5. Repurpose the piece as an interactive web page and training tool within the company intranet. Agents should be able to click each statement to bring up on-screen pop-ups that reveal the supporting payoff / sales remarks (from the reverse side of the printed piece). Why pop-ups? They keep users on the page. With the printed piece users must flip over to Side 2 for the payoff. On the web, information delivery is often more effective when users don’t have to leave the page.